So. We live in an off-grid tiny home (ie a 280 square foot camping trailer) and we’re busy building a house. Just the situation and time to bring home 17 baby chicks from the feed store, right? I think you’re probably right. But we brought them home anyway. You see, we had a plan! We had two hens go broody, and while we eventually decided that we didn’t want them to hatch any of our own eggs (we don’t want our rooster procreating), the idea of baby chicks had taken hold. 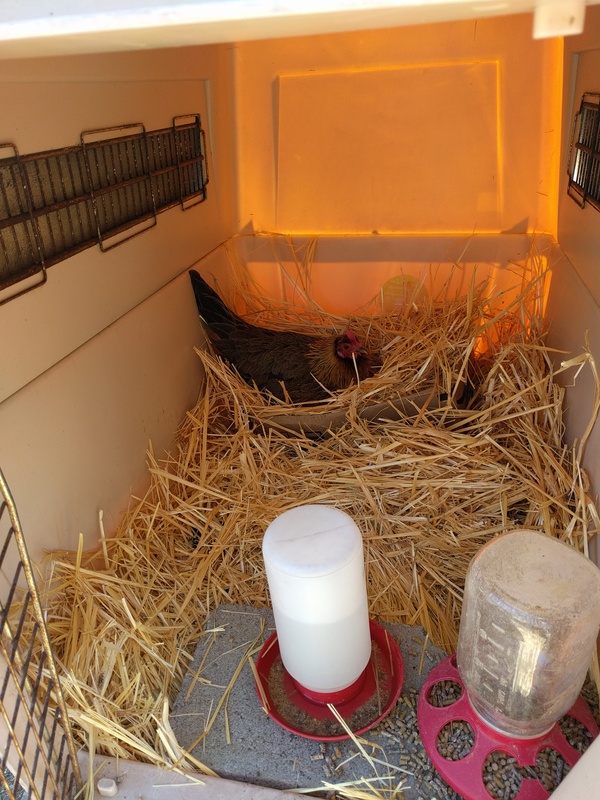 So, we put one of the hens in her own penthouse suite (ie, and old dog crate), and let the other sit in one of the egg laying nests in the main coop. Both hens were sitting on a few golf balls. These make excellent, cheap imitation eggs. Our plan was to let them sit on their “eggs” for a few weeks, then buy chicks from the feed store and do a little switcheroo and the hen will think her “eggs” hatched. And I’m here to tell you that it works! 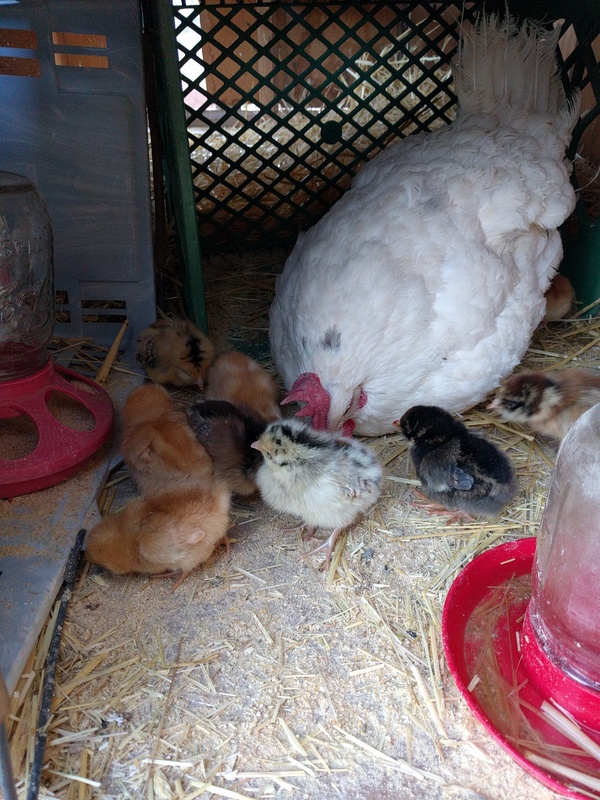 On Wednesday, April 19 we bought 9 chicks (4 Gold Sexlinks, 4 Ameracaunas, and 1 Golden Laced Wyandotte). We gave the chicks to our broody Austra White, “Bluebell” (so named because she has a blue band on her leg) at about 4pm. 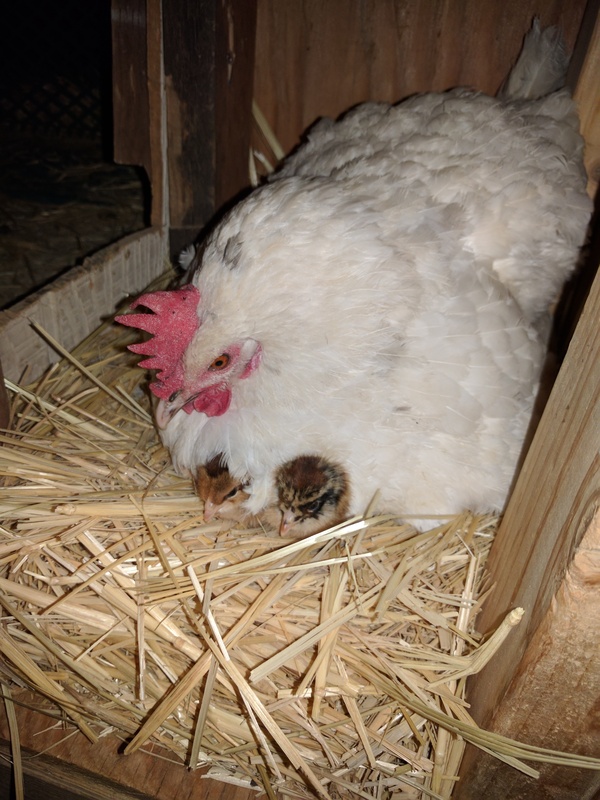 She was a bit confused at first, and the chicks didn’t know what she was, but within about 10 minutes, all the babies were snuggled up under their new mamma and she was happily clucking away to them. The next morning, they were all out in the enclosure I set up inside the coop so that they had a bit of space to move around, but would be separated from the rest of the flock. They hung out in this space for a couple days. I figured by using crates, the other hens would be able to get used to the chicks so that by the time I started letting them out into the larger area and even out into the run, there shouldn’t be any problems. Inside their enclosure inside the coop. At this point, everything was going so well. I was exstatic that it was working out just as I’d read about. Bluebell was a good mamma. She kept the babies warm when needed, and was even careful how she stepped around them. Good mamma, keeping her babies warm! I was excited for Phase 2: more chicks to give to “Roadie”, our other broody hen. We attempted to repeat our success. And that’s where everything went to pot. Roadie rejected the chicks! 😞 She kept pecking them away. More on that later. So now we had 17 chicks and only one mamma hen. I have heard stories of a hen hatching out and caring for a large brood, so I figured we’d try giving the other chicks to Bluebell and hope she could raise them. At least for the night until we got a brooder of some sort set up for some of them. On Saturday morning, I found a chick dead in the nest box. It had been crushed. 😢 Seems 17 was just too many. Go figure. And a weird thing that morning is that Bluebell was pecking at two of the new chicks. Just the two Barred Rocks. None of the others. So we rescued those two and set up a brooder box for them. And we figured that since we had to do it for two of them, we’d pick out several others and lighten Bluebell’s load. So, besides the two Barred Rocks, we grabbed a Welsummer, a Sexlink, the Wyandotte, and one of the Ameracaunas. The Wyandotte and that particular Ameracauna are special to Flower Girl and Princess Girl. That left 10 chicks with Bluebell. Five of them are from the older group, and 5 are from the younger group. Two days age difference doesn’t make hardly any difference at all. And she has been a great mamma. They are just over a week old now and have started roaming outside and even free-ranging with the flock. The other hens and the rooster leave the chicks alone, even Roadie who is back in with the flock. I have seen Bluebell run off the other hens if she doesn’t want them around, and she gets antsy if the chicks wander too far away from her, especially if they are on the other side of the fence from her! 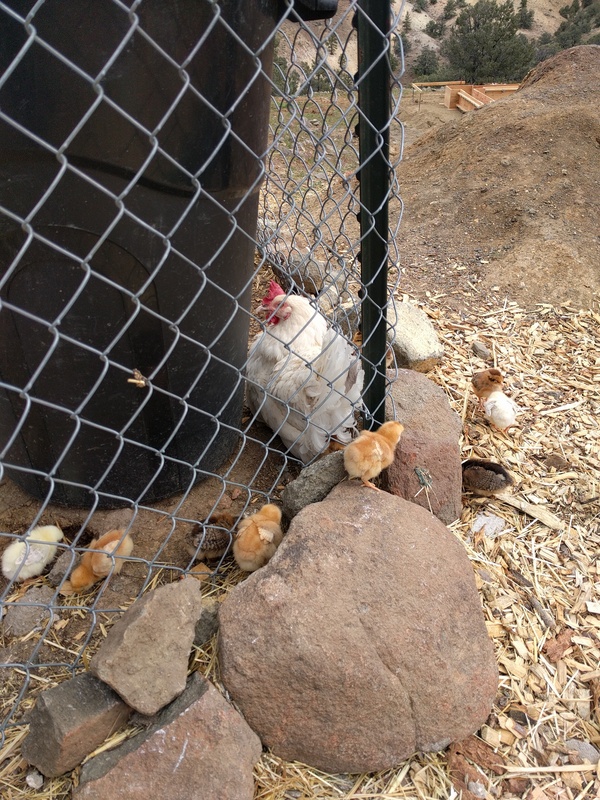 It is great to have all those little chickies running around! So, remember when I mentioned that Roadie was pecking at the chicks and Bluebell pecked at only certain ones? I have a theory why that happened. In Roadie’s kennel crate, I had noticed that mice were getting in to eat her food. Annoying, but I didn’t think to much of it till she started pecking at the chicks. I betcha that she didn’t know the difference between her babies and the pesky mice that would come to eat her out of house and home. And the Barred Rock chicks are black, so maybe Bluebell also thought they were mice since I see evidence of them in the coop from time to time. I dunno. I could be crazy. Roadie could just be a bad mom. And Bluebell could just not like the color black. Either way, I think before I try the kennel again for a broody hen, I’ll have to find a way to solve the mouse problem. So that is our success story, and our failure. I learned a lot and hope you did, too. 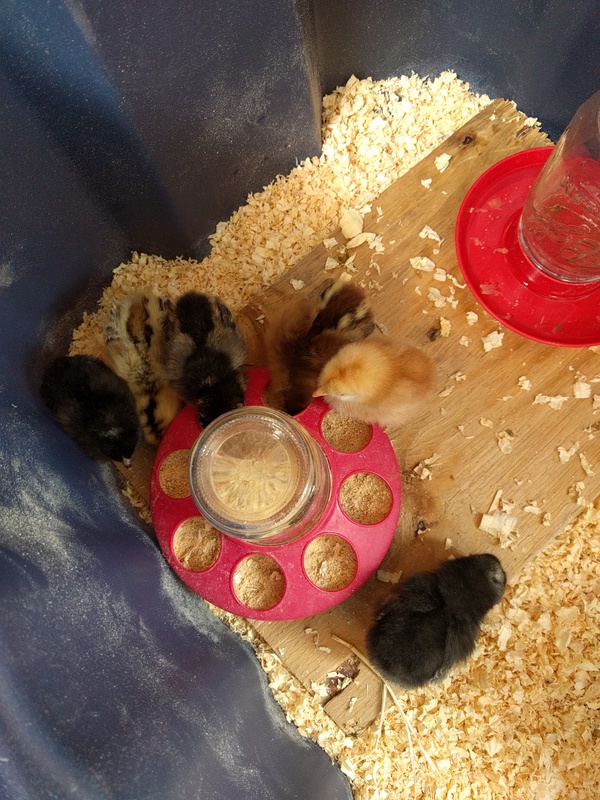 I’ll write up another post about how we have the brooder set up, and what we did until we got a heat source that would work on our off-grid solar system. This entry was posted in Chickens, Producing Our Own Food, Trailer Living and tagged Backyard Chickens, Chickens, Hens, Homesteading, Off Grid, skills, Sustainability, Sustainable Lifestyle on April 29, 2017 by Maridy. This is so interesting! I’m glad everything seems to be working out, but your theory about the black chicks looking like the pesky rodents makes sense! 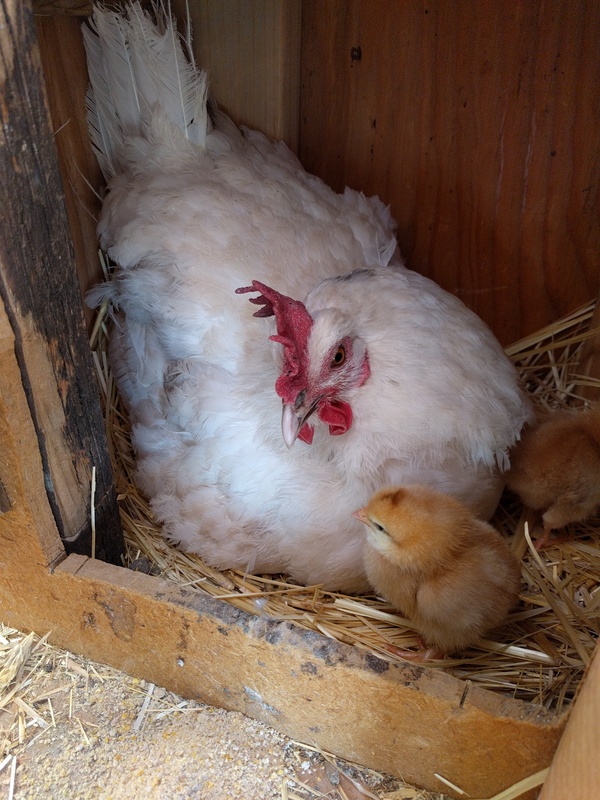 I am curious to read your next post about how to set up a brooder off-grid. I have been wondering how to do that. I saw, in one of your pictures, your foundation walls of your new house. I am so, so jealous, but very happy for you!